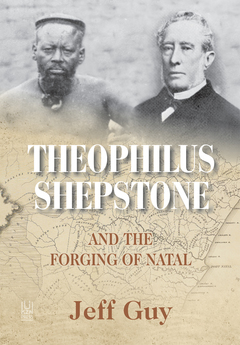 Theophilus Shepstone and the Forging of Natal: African Autonomy and Settler Colonialism in the Making of Traditional Authority is an account of the life of Theophilus Shepstone, Secretary for Native Affairs in the Colony of Natal from 1846 to 1876 and an examination of the nature of the concept of traditional authority in South Africa today. As originally conceived the book intended to place Shepstone in the context provided by some of Jeff Guy’s previous books (The Destruction of the Zulu Kingdom, 1979; The Heretic: a Study of the Life of John William Colenso, 1983. The View Across the River: Harriette Colenso and the Zulu struggle against Imperialism, 2001). But, in the process of researching and writing, it became apparent that such widely used concepts as indirect rule and segregation, so often associated with Shepstone, had lost whatever explanatory value they might have had. Furthermore the urgent contemporary debates in South Africa over the nature of customary law and traditional authority and their role in a constitutional democracy suggested strongly that Shepstone’s part in their origins should be re-assessed. The book does this however, not by a process of political theorization, but by placing the arguments very deliberately in a historical narrative and the development of personality and character in their own times. This is done out of the conviction that, unless understood as history, the most contentious contemporary issues will continue to be misunderstood.